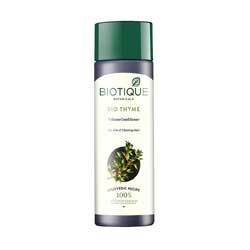 Biotique Bio Thyme Free Sparkle Volume Conditioner conditions, hydrates hair, revitalise scalp and gives shine, stops hairloss. Bio Thyme Volume Conditioner - Conditions & Hydrates Hair, Revitalise Scalp, Stops Hair Loss, adds volume to hair. Worldwide Shipping . Ships usually within 2 days. After Shampoo Conditioner for Additional volume to hair. Helps revitalise scalp and adds volume to hair. Stops hair loss. Ajwain (Trachyspermum ammi) 1.0%, Daruhadi (Berberis aristata) 5.0%, Suraj mukhi tail (Helianthus annuus oil) 1.0%, Jaitun tail (Oleaeuropoea oil) 1.0%, Dharu tail (Lavendula stroechas oil) 0.5%, Pudina tail (Mentha arvensis oil) 0.5%, Soybean protein 1.0%, Himalayan Water Q.S.